early 4th c.: Earliest manuscript of the Protevangelium of James. Tells the events preceding Mary’s birth through the Massacre of the Innocents. 5th century: Earliest accounts of the Death of Mary or Transitus Mariae. Appeared in Latin as the Pseudo—Melito and the Pseudo—Joseph of Arimathea. 7th or 8th c.: The Gospel of the Pseudo—Matthew appears, with the Gospel of the Nativity of Mary following in the 9th century. These amplify the Protevangelium with miracles and teachings. Pseudo—Matthew was the principal source for medieval French and English mystery plays. high medieval period: Whole cycles of “the Life of Our Lady” develop, condemned at Trent (1545—1563). 2nd century: In his Against Heresies, Irenaeus depicts Mary as a “second Eve,” a foundational statement for the later development of Christian theology especially on Mary as a representative or symbol of the church. 431: Against Nestorius, who called Mary only “Christotokos"—mother of Christ—the Council of Ephesus affirms that Mary is “Theotokos"—mother of God. This supports and extends the devotional cult of Mary in the church. early 8th century: Germanus of Constantinople (d. 733) says, “There is no one to whom the gift of grace is given except through Mary.” This is the earliest explicit testimony to the idea that Mary dispenses graces to the church on earth. 8th century: The title Mediatrix, as applied to the Mother of God (indicating a belief that Mary shared in the saving mission of her son), is first used by Andrew of Crete (d. 740), Germanus of Constantinople (d. 733), and Tarasius (d. ca. 807). 9th century: From the East, the title “Mediatrix” is introduced into the West through a translation by Paul the Deacon of the Life of Theophilus, in which the term is used. From the 12th century on, it is applied to Mary with ever—increasing frequency until it becomes generally accepted in the Roman Catholic Church in the 17th century. 12th century: Bernard of Clairvaux (d. 1153) popularizes the teaching that Mary is dispenser of grace to Christians, which becomes widely accepted during the Middle Ages. His statement “God has willed that we should have nothing that did not pass through the hands of Mary” was oft—repeated in that period. late 14th century: The title “Coredemptrix” first appears in Catholic literature. 19th century: Cardinal Newman rediscovers Irenaeus’s image of Mary as the new Eve, leading to renewed attention to the Mary-church analogy and typology. 1954: Pius XII orders the universal observance of Mary’s queenship (and dispensing of all graces to the faithful) on May 31. 1963: Vatican Council II votes against dealing with Mary in a separate document, deciding instead to speak of Mary in the document on the Church (Lumen Gentium). The title of her chapter, “The Blessed Virgin Mary, Mother of God, in the Mystery of Christ and the Church,” placed her in close relationship with her Son and with his Mystical Body. 2nd century: “Born of the Holy Spirit and the Virgin Mary” used in baptismal creeds. 2nd–4th century: Art of the catacombs and the early apocrypha testify to the increasing veneration of the Mother of Jesus. 4th century: Greek manuscript fragment asks the “Mother of God” for protection. 4th century: Some churches, including Nazareth’s Church of the Annunciation, are dedicated to Mary. 4th century: Athanasius (d. 373) proposes the Virgin Mary as an example to dedicated virgins, and Ambrose (d. 397) devotes a series of writings to Mary as model of Christian virginity. early 5th century: Severian of Gabala (d. after 408) calls the praise of Mary a daily custom—she is called on before the apostles and martyrs. early 5th century: Sixtus III (432–440) rebuilds St. Mary Major in Rome to commemorate the Ephesus Council’s Theotokos decision. early 5th century: St. Nilus (d. 430) says the praise of Mary is found in every land and language. 5th and 6th century: Lead seals bear the inscription servus Mariae—servant (or slave) of Mary. 5th century: A “remembrance of Mary” feast is inaugurated, corresponding to the dies natalis (birthday into heaven) of the martyrs. Part of the Christmas liturgy, perhaps on December 26 at first, then on January 1.
mid-6th century: Feast of the Annunciation (Mar. 25) inaugurated. late 6th century: Feast of the Nativity of Mary (Sept. 8) inaugurated. late 6th century: Emperor Maurice (d. 602) makes universal in his territory the feast of the “falling—asleep of the Mother of the Lord,” the later Assumption feast (Aug. 15). Early 7th century: Eastern homilist Sophronius (d. 638) extols Mary’s power of intercession. 7th century: Eastern monks introduce the main Marian feasts to the West. 8th century: Presentation of Mary feast inaugurated in the East. 8th century in the East: The feast of the “conception of St. Anne” celebrated; later developed into the Immaculate Conception in the West. Late 8th c.: Alcuin promotes Saturday as Mary’s day. 12th c.: Marian devotion increasingly focuses on Mary’s compassion on Calvary and, based on the doctrine of her assumption into heaven, her present assistance to all Christians. 12th c.: The “Hail Mary” prayer first used, and paired with the Rosary. 12th–13th c.: “The Age of the Virgin": a sharp increase in literary and artistic treatments of Mary, associated with a focus on the unity of the church on earth and in heaven (the saints) and a growing emphasis on the humanity of Jesus—the passion, his real presence in the Eucharist, etc. 13th c.: Cathedrals dedicated to Mary. 13th c.: Francis and Dominic start special devotion to Mary. 13th c.: Mary figures prominently in the theology of Bonaventure (d. 1274), Albert the Great (d. 1280), Thomas Aquinas (d. 1274) and Duns Scotus (d. 1308). Late 14th c.: Feasts of the Presentation of Mary (Nov. 21) and the Visitation (July 2; now May 31) introduced in the West. 15th c.: The “Hail Mary” attains its current form. 15th c.: Meditation on the life of Mary, as on the life of Jesus, increasingly prominent, along with increased attention to attaining a deep, rich inner life. 16th c.: The Reformers do not completely reject veneration of Mary, but limit it to imitation of the humble, obedient, Virgin Mother of the Gospels. The Reformers did reject calling upon any saint, including Mary, for assistance. 1545—1563: Council of Trent defends the cult of Mary and the saints, including the idea that they can intercede for Christians. 16th c.: Marian associations begin to develop: the first is the Sodality of Our Lady, founded under Jesuit guidance in 1563. 17th century: Especially in Spain and France, new focus on Mary’s “queenship” and imitation of the child Jesus in his dependence on Mary (sometimes called “slavery” to Mary and practiced complete with chains). 17th and 18th c.: Popular exaggerations of Mary’s intercessory role lead to dispute within the Catholic church. 19th c.: Apostolic zeal recognized as an authentic manifestation of dedication to Mary. Missionary orders founded, dedicated to Mary. 19th and 20th c.: Shrines to Mary appear at Lourdes (1858) and LaSalette (1846) in France and at Knock (1879) in Ireland. In the 20th c., this continued with Fatima (1917) and others. Other sites of claimed revelations were rejected by the church and public devotions there forbidden. A warning on these matters was issued in 1951. World War I: Benedict XV addresses many appeals to the Queen of Peace. 1931: Pius XI commemorates the 1500th anniversary of the Council of Ephesus. 20th century: The Catholic church holds many Marian congresses and sponsors pilgrimages to many Marian shrines. The Odigitria or Our Lady Guide of Wayfarers, reputedly Luke’s portrait of Mary, shows Mary standing with a Christ child who blesses the viewer, or enthroned, often with an angel on either side. 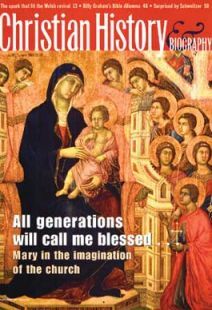 The Orans or Praying Madonna is both ancient and widespread. In the Deesis, Mary is at the right and John the Baptist at the left of the enthroned Christ Pantokrator—that is, “all powerful.” These are often found in apses and in tombs. Other Eastern types that are more folkloric—appearing less in churches than in the folk art—include the Nursing Madonna or Galaktotrophousa, which appears early in Egypt—an adaptation of Isis nursing Horus; the Eleousa or Virgin of Tenderness; and the Glykophilousa, depicting the Christ child kissing his mother. The West often borrowed its types of Mary from the East. The Maria Regina, showing Mary crowned as an empress, originated in the West in the 6th century. The Majestas Mariae, Virgin in Majesty, is found enthroned in Roman churches’ apses and in Romanesque statuary, and on the tympanums of cathedrals. In the High Middle Ages (12th–13th c.), the Italian masters increasingly portrayed Mary as the epitome of idealized womanly beauty. Their treatments are so numerous that the term “Madonna” has been adopted in other languages.